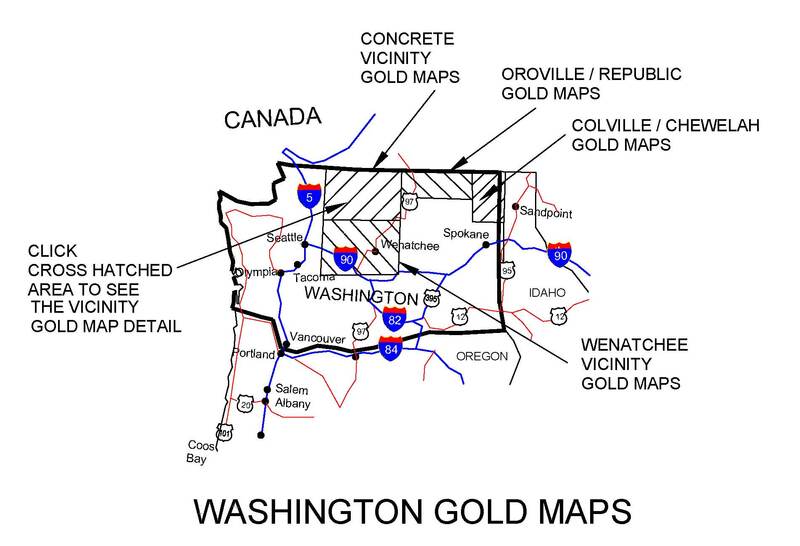 GOLD IN WASHINGTON - GOLD MAPS FOR GOLD PANNING, METAL DETECTING AND PROSPECTING WITH OVER 2000 GOLD SITES. GOLD MAPS ARE GREAT FOR GOLD PANNERS, PROSPECTORS, ROCK HOUNDS, CAMPERS, HIKERS, AND GEOLOGIST. THE LOCATION AND MINERAL OCCURRENCE OF GOLD FOR THESE SITES CAME FROM EXTENSIVE RESEARCH OF THE WASHINGTON DATA FILES FROM THE U.S.G.S. DOCUMENTS. 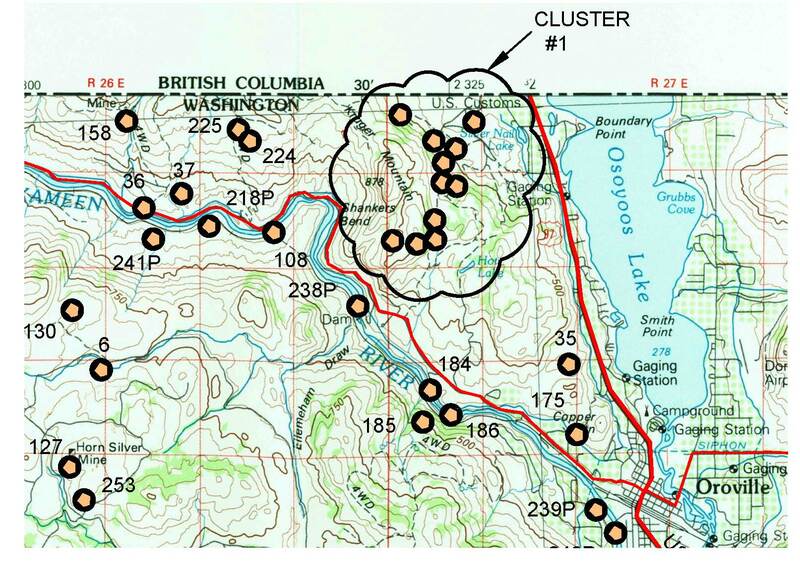 GOLD MAPS INCLUDE GPS DATA AND WERE PREPARED IN THE AREAS OF WASHINGTON IN WHICH THE MOST OCCURRENCE OF GOLD HAS BEEN FOUND AND ARE LISTED BELOW. There is still gold in the creeks and streams in Washington. The best chance to find Gold in these creeks and streams, placer deposits, and near old mines and prospects, is to know where the occurrence of gold has been found. Before you dig or pan for Gold you will need a map to show you where to look. These Gold Maps provide you with past gold mines, placers and prospect sites. The venture will be interesting and challenging. When you do make a Gold find it will be very exciting. In the past, it was not uncommon for one to find 1 to 6 ounce nuggets in the streams and placers. Those days may be gone, but with some luck and a lot of determination you find some gold or even a gold nugget. There are present day stories of modern day prospectorsfinding nuggets today. In July, 2013, a 13 ounce nugget was found near Liberty, Washington, which is near Wenatchee, Washington. Mt. 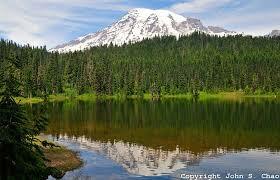 Rainier is shown in the picture to the right. GOLD PANNING IS FUN - Families on outings, hikers, campers and fishermen are enjoying the fun of combining a little recreational gold panning with their other outdoor activities. A portion of the Gold map from the Oroville / Republic Gold maps is shown below. The gold sites are noted and shown with a numerical number next to each site are the REAL DEAL. These gold sites represent where gold has been found in the past. (Some online web sites claim that placer or lode active claimed areas as found in the blm data base represent present day gold sites. The blm does not categorize minerals shown in the claimed areas. An active claimed area may be prospected for a variety of minerals from gold to silver to tungsten to lead to rubies to quartz to sand.) The number is referenced to a north latitude and west longitude point. The gold sites are shown adjacent to access roads and streams. The sites are plotted on a USGS topographic map which shows the contours of the land. A 'P' next to the record number shows were placer gold deposits have been found. Roads are highlighted in red and old Miners Camps / Historical towns are shown on the gold maps. A gold cluster is shown when there are too many gold sites to show the GPS number next to them. An attachment is sent with the gold map showing the gold site and its GPS record number. Hiking trails are noted by a 'H' in a red circle with a 'T' next to it. 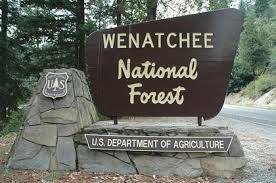 The picture to the right is an entrance sign to the Wenatchee National Forest. Recreational Gold panning is allowed within the National Forest. Full Color USGS Topographic Quad Sheet at 1:100,000 scale. Detail Map. Gold maps well liked at GPAA gold show. We offer quality gold maps with 100's to 1000's of gold sites with ghost towns custom plotted on an easy to read large 24" x 36" color topographic maps that gives you a birds eye view of the gold fields in the counties or state of interest. These gold maps provide you with the best use of your research time of the gold fields of interest. You do not have to spend a great deal of hours or even days sifting through 1000's of gold sites on a computer on-line site and then pick and choose the gold sites and then patch them together on an 8 x 11 printout. We have done the research for you and have plotted the gold sites with GPS out for easy use so you can get started prospecting and panning immediately. The cross hatched areas shows the gold maps that are for sale in the state of Washington. OROVILLE / REPUBLIC Gold maps - 567 GOLD SITES Towns in the vicinity - Oroville, Brewster, Republic, Curlew. Okanogan and Coleville National Forest. Ghost Towns / Miners Camps and Historical towns - 14. COLVILLE / CHEWELAH Gold maps - 186 GOLD SITES Towns in the vicinity - Newport, tiger, Orin, Colville. Kanisku National Forest. WENATCHEE Gold maps - 555 GOLD SITES Towns in the vicinity - Wenatchee, Blewett, Liberty. Snoqualmie and Wenatchee National Forest. Ghost Towns / Miners Camps and Historical towns - 9. Recent gold finds in the area include a 13 OUNCE GOLD NUGGET FOUND NEAR LIBERTY, WASHINGTON. This gold nugget was found in July, 2013. The gold sites for the Liberty area are shown on the Wenatchee Gold Maps.